Madwar, Samia. "Inuit High Arctic Relocations in Canada". The Canadian Encyclopedia, 11 September 2018, Historica Canada. https://www.thecanadianencyclopedia.ca/en/article/inuit-high-arctic-relocations. Accessed 20 April 2019. This map illustrates the distance between relocation destinations from Inuit homes in Inukjuak. Grise Fiord, on the southern shores of Ellesmere Island, now Canada’s and Nunavut’s northernmost community, is about 2,000 km away from Inukjuak. South of that is Qausuittuq (Resolute Bay), on Cornwallis Island, approximately 1,934 km away from Inukjuak. Craig Harbour, on Ellsemere Island, is also nearly 2,000 km away from Inukjuak. Some families from Mittimatalik (Pond Inlet), on the northern tip of Qikiqtaaluk (Baffin Island) were relocated to help the Inukjuak Inuit with the transition to the High Arctic. The distance from Mittimatalik to Inukjuak is almost 1,600 km. Canadian officials had various motives for relocating Inuit to the High Arctic. One reason concerned Arctic sovereignty. During the Second World War, the United States had established a military presence in the Arctic. 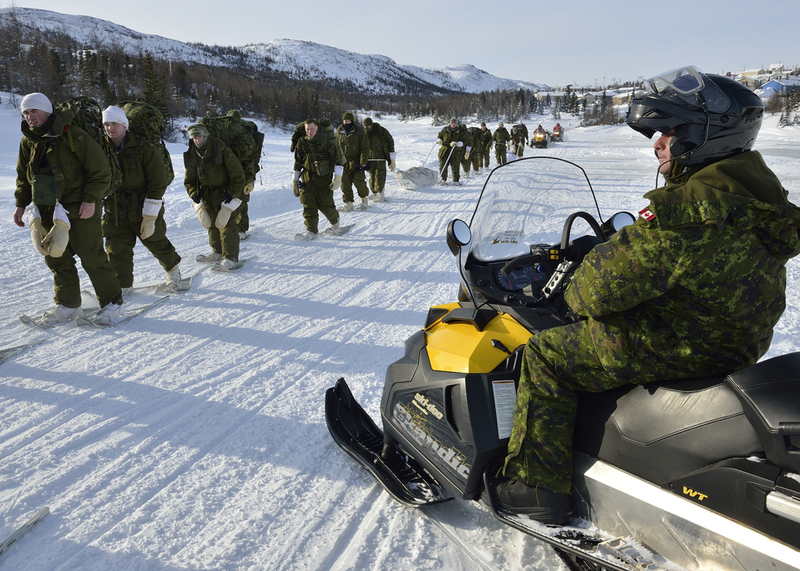 Amid Cold War	fears of Soviet aggression, the United States heightened its military capabilities in the Arctic, posing a potential threat to Canadian claims to the North. The Department of Resources and Development, which oversaw Inuit affairs at the time, decided to populate Ellesmere and Cornwallis	islands with Inuit, even though the areas were devoid of human population. Trade and economics also played a role in the relocations. In 1952, the Canadian government hosted a conference in Ottawa (attended by government officials as well as representatives of the Hudson’s Bay Company, the Roman Catholic and Anglican	churches, the United States embassy and the National Film Board) to discuss solutions to the declining fur trade	that, it was feared, would leave some Inuit in need of government assistance. Attendees — exclusive of Inuit — concluded that Inuit should be made to return to their traditional lifestyles, ending their reliance on trading posts or government support. Relocating Inuit to places where they could hunt and gather seemed a good solution. Federal government officials chose Inukjuak (Port Harrison), in Northern Quebec, as the community to relocate farther north. Inukjuak was well-established at the time, with a population of around 500, and a school, nursing station, Hudson’s Bay Company trading store, police post, weather and radio station, and church missions. The area was rich with wildlife. Inuit families had camps near the community where they would hunt, trap and fish. In 1953, one RCMP officer, an interpreter and an Inuit Special Constable providing translation, began recruiting Inuit families for resettlement in the High Arctic, about 2,000 km away. The officers described improved living conditions in the northern locations, as well as abundant wildlife for hunting. The officers misled some individuals to believe that their family members had agreed to the relocation, and that they would be given the option to return after two years. Even if they were unwilling to leave their community, power dynamics between Inuit and non-Inuit at the time were such that many Inuit felt they had no choice but to agree to the relocation. 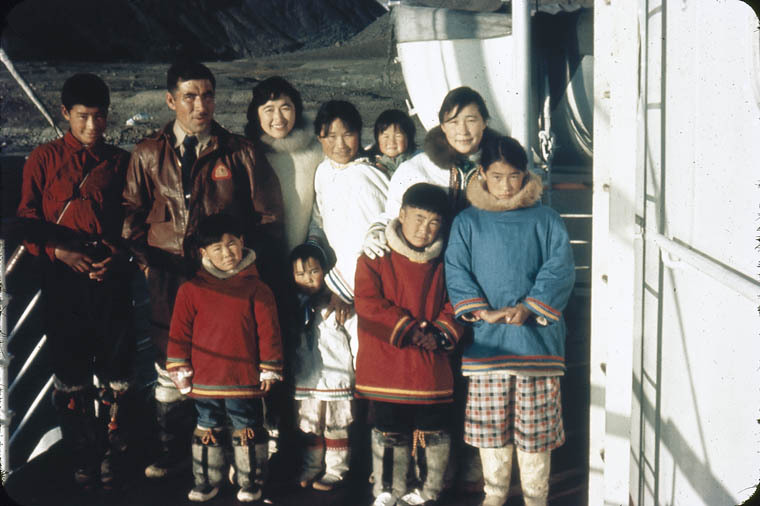 In July 1953, seven Inukjuak families boarded the ship CD Howe, which would take them to their new homes. According to personal accounts, relatives and community members went out in their boats to watch the ship depart. Some of those on board cried at being separated from their families. The CD Howe sailed northward and arrived in Mittimatalik (Pond Inlet), on the northern coast of Baffin Island, in August, where three local families boarded. The Mittimatalik families were meant to assist the Inuit from Inukjuak in adapting to High Arctic living conditions. In late August, the ship arrived in Craig Harbour, the site of a police post and trading store on the southern coast of Ellesmere Island, where it joined with another ship, the d’Iberville. The Inukjuak relocatees learned that they would be further divided, with two families disembarking at Craig Harbour, accompanied by one Mittimatalik family, and the others continuing to two other destinations on board the d’Iberville. The news was devastating: some Inuit had only agreed to the relocation so that their families would not be divided. In the Isuma TV production Exile (2009), relocated Inuit families recall crying at the separation, with even their dogs crying in distress. The d’Iberville returned in September, as ice had blocked the way to Cape Herschel, one of the intended relocation sites. Two more Inukjuak families and one Mittimatalik family disembarked in Craig Harbour, and the remaining passengers were taken to Qausuittuq (Resolute Bay). The first Inuit camp was located 100 km from Craig Harbour; the distance was meant to prevent relocated families from relying on outside supplies to survive. In 1956, the police and trading posts moved to Grise Fiord, and the Inuit settlement followed a few years later, establishing what is now Canada’s northernmost inhabited community. The Inuit camp at Qausuittuq on Cornwallis Island was located a few miles from a military base and weather station. In 1953, a police post had been reintroduced, along with a trade store. In 1955, four more families from Inukjuak and two from Mittimatalik were relocated. One Inukjuak family was brought to Craig Harbour, while the other passengers were moved to Qausuittuq. Relocated families found it difficult to adjust to the new surroundings. One of the most challenging issues was the continuous darkness of the High Arctic winter. In Inuktitut, the word for Resolute Bay, Qausuittuq, means “place of darkness” — a description that was all too real for the relocated families. The conditions in Qausuittuq and Craig Harbour were also unlike those that they had been accustomed to at home in midsummer. These were frozen lands, ones that would not thaw like those in Inukjuak. Such conditions were not suitable for building igloos, so the families had to spend their first winter in canvas tents. With no other source of fuel accessible to them, they burned seal oil in lamps and wood from packing crates in small, homemade, wood stoves. The RCMP gave them bison hides with which to cover their canvas tents. The relocated Inuit had been promised plentiful game, only to learn that the nearby caribou and muskox populations were depleted. The families were told upon arrival that they would be allowed only one caribou per family, and that they would be heavily fined or arrested if they were caught shooting muskox. In place of the nearly 50 varieties of wildlife they had hunted and fished in Inukjuak, including mussels and clams, eider duck	and geese, the relocated families had to adjust their diet to accommodate available game, including seal and polar bear. Despite the help they received from Mittimatalik families in adapting to local conditions, the relocated Inuit struggled to find food. With little to eat, some Inuit took to scavenging food scraps from the dump by the military base. When they were caught, the RCMP searched their tents and confiscated the scavenged food. In the 1960s, the settlement at Qausuittuq became more established. An RCMP post was set up, and some houses and a school were built. Some Inuit men were employed at the base, though it was still fairly exclusive to non-Inuit. A bar opened, allowing Inuit and non-Inuit to mix. Still not accustomed to the extreme cold of the High Arctic, the Resolute Bay bar became a popular spot for locals. In interviews, some relocated Inuit later said alcohol became the only way to tolerate the living conditions. (See also Alcoholism.) Increased alcohol consumption led to cases of domestic violence, which in turn affected the children of these relocated adults. (See also Family Violence.) In the 1970s, the bar was shut down. During the 1970s and 1980s, many relocated Inuit returned to their respective home communities, many paying their own way. In 1988, the federal government acknowledged that it was responsible for returning the Inuit and began paying for their return to Inukjuak, either permanently or for a visit. Families were once again painfully divided, as some opted to stay in the High Arctic and others chose to leave. In 1994, the Royal Commission on Aboriginal Peoples issued a report on the relocation program, incorporating testimony from Inuit as well as government officials and historical documents. The report acknowledged that the Inuit had not given free and informed consent to the relocations, and that the government owed them an official apology. John Duncan, then federal minister of Indian Affairs and Northern Development, delivered an official apology in 2010, and commended the relocated Inuit for establishing a Canadian presence in the High Arctic. That same year, Nunavut Tunngavik Inc. — the organization that ensures the promises of the Nunavut Agreement are upheld — unveiled monuments to the relocated families in Grise Fiord and Qausuittuq. The High Arctic relocations are among several such attempts by government to move Indigenous peoples in Canada for various purposes, all of which have contributed to intergenerational trauma. In interviews, children of High Arctic relocated Inuit have said their parents and grandparents rarely wanted to discuss what had happened to them and tried to hide the pain. Family separations, whether due to the relocations or to tuberculosis treatments, also created a gap in cultural knowledge, as many children were unable to learn from their parents and elders. Today, many Inuit are working hard to bridge that knowledge gap. Royal Commission on Aboriginal Peoples, “The High Arctic Relocation: A Report on the 1953-55 Relocation” (1994). Shelagh Grant, “Errors Exposed: Inuit Relocations to the High Arctic, 1953-1960,” Documents on Canadian Arctic Sovereignty and Security No. 8 (2016). MEMORIAL Read more about the Arctic Exile Monument Project, funded by Nunavut Tunngavik Inc. to honour relocated Inuit families. DOCUMENTARY Watch Exile, a 2009 Isuma Productions film by Zacharias Kunuk. NATIONAL FILM BOARD Watch Martha of the North, a film by Marquise Lepage about Inuit relocations in the mid-1950s. QIKIQTANI TRUTH COMMISSION The Qikiqtani Inuit Association’s report, The Qikiqtani Truth Commission: Community Histories 1950–1975, explores the history of the Qikiqtaalungmiut (people of Resolute Bay), including the relocations. NATIONAL FILM BOARD Broken Promises (1995) is an NFB film by Patricia Tassinari that explores High Arctic Relocations. THE TORONTO STAR Read Paul Watson’s article, “Inuit were moved 2,000 km in Cold War manoeuvring” (29 November 2009). CBC NEWS NORTH Jean Sponagle reports, “'We called it 'Prison Island': Inuk man remembers forced relocation to Grise Fiord” (30 June 2017). IQQAUMAVARA Explore a collection of interviews with relocated Inuit and their descendants.